Hollywood, CA (November 14, 2018) -- Netflix has acquired global rights (excluding Japan, China and UK free TV rights) to The Boy Who Harnessed The Wind, the directorial debut of Academy Award® nominee and BAFTA Award winner Chiwetel Ejiofor. The British film is based on the bestselling book of the same name written by William Kamkwamba and Bryan Mealer. Ejiofor wrote the screenplay. ● Netflix, Participant Media, BBC Films and BFI present, in association with Head Gear Films & Metrol Technology, Lipsync and Cornerstone Films, a Potboiler Production. ● Synopsis: Adapted from the bestselling book by William Kamkwamba and Bryan Mealer, The Boy Who Harnessed the Wind follows 13-year-old William Kamkwamba (newcomer Maxwell Simba) who is thrown out of the school he loves when his family can no longer afford the fees. 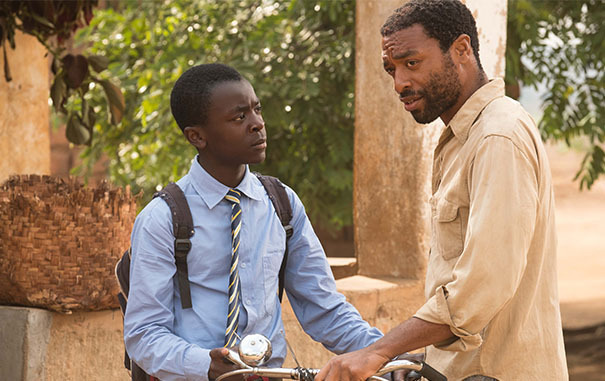 Sneaking back into the school library, he finds a way, using the bones of the bicycle belonging to his father Trywell (Chiwetel Ejiofor), to build a windmill which then saves his Malawian village from famine. The emotional journey of a father and his exceptional son at its heart, William’s tale captures the incredible determination of a boy whose inquisitive mind overcame every obstacle in his path. ● The film highlights the power of education and individual determination to change the trajectory of a life, a village and a nation. By telling the story of one boy’s efforts to overcome the barriers he faces to education, The Boy Who Harnessed the Wind inspires audiences to imagine a future where every child, in every village, has access to knowledge and to opportunities to put that knowledge to work. ● The film was shot in Malawi last year. ● The British film has been backed in development and production by the BFI (with National Lottery funding) and BBC Films with Head Gear, Metrol Technology and LipSync, in partnership with Participant Media. LipSync Post is also on board to complete full post production. Cornerstone Films is the international sales agent. ● The deal was negotiated on behalf of Participant Media by Gabriel Brakin, General Counsel & EVP of Business Affairs and Krista Wegener, SVP of Sales & Distribution, along with CAA Media Finance.